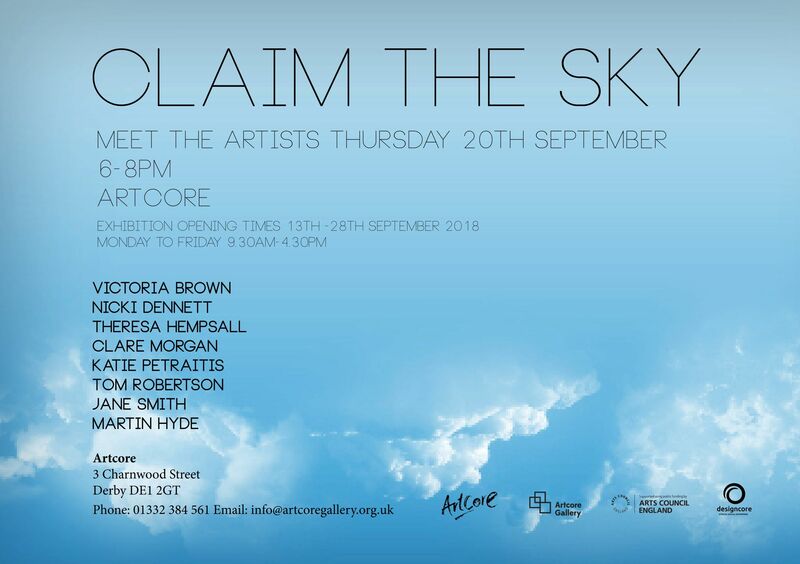 Artcore would like to invite you to our latest exhibition, Claim the Sky. This exhibition focusses on the theme of health and wellbeing that features the work of eight local artists: Nicki Dennett, Victoria Brown, Theresa Hempsall, Tom Robertson, Clare Morgan, Jane Smith, Katie Petraitis, and Martin Hyde. Each of the exhibiting artists have been involved in Artcore’s health and wellbeing programme either through leading workshops or other creative activities. We will be hosting a Meet the Artists event on Thursday 20th September from 6-8pm and would like to invite you to join us for talks, networking, refreshments, and a tour of the exhibition.